….If Mr. Obama overestimated his powers of persuasion in reaching quick agreement with the Russians, they misjudged how far they could get him to bend. In the end, they compromised on nonbinding language. And so, after all the fits and starts, all the miscalculations, the vodka toasts that proved premature and the stare-downs that nearly sank the whole enterprise, Mr. Obama hung up the phone again with Mr. Medvedev on Friday, this time having finally translated aspiration into agreement. The main reason for Obama’s ire, according to a senior administration official, who asked not to be named, was that Biden had gone to Israel specifically to deliver a message to Netanyahu: the main issue is now Iran and its nuclear program, and we can’t allow ourselves to be distracted by other issues or to jeopardize the emerging alliance against Tehran in support of tough sanctions — an alliance which includes most of the leading Arab states. In particular, Netanyahu — who campaigned for office himself on the primacy of the Iranian nuclear issue — can’t afford to allow Israel’s leading defender on this issue, the president of the United States, to look as if he’s weak or lacking influence….And that of course is precisely what happened. Netanyahu’s government made Obama look bad, undermining the effort against Iran. Italics mine in both excerpts. It goes without saying that both of these stories are based on sources who have an agenda. And we don’t know what that agenda is. So take this all with a few grains of salt. But the connecting tissue here is Obama’s backbone. Domestically, he played hardball to get healthcare reform done this month and he threw down the gauntlet on recess appointments this weekend. 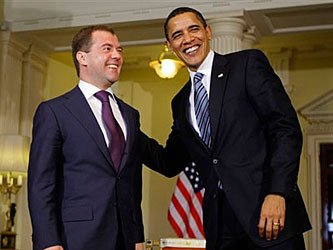 Internationally, he played hardball with Medvedev — or convinced him he was playing hardball, anyway — over arms control, and was upset with Netanyahu less over the Jerusalem housing project per se than over the fact that it was a bungle that handicapped his ability to play hardball with Iran. Conservatives are unhappy over Obama’s domestic hardball and liberals are probably uneasy over the international hardball — espcially if Hirsh’s report about Iran is true. But they’re opposite sides of the same coin. A good president knows when to compromise, and also knows how to beat up his opponents enough to make compromise possible. It’s still early days, but Obama seems to be developing a pretty good sense for this stuff.